The collective bargaining power of public employee unions has been at the forefront of political debate over the past year. Elections in 2010 ushered in Republican governors and state legislative party leaders with the number one goal of reducing the size of government. To accomplish this drastic government downsizing, Republican controlled states began considering legislation to diminish public employees’ rights to collectively bargain and to force these workers to pay a larger portion of their healthcare and pension benefits. Wisconsin has been in the spotlight of these new “reforms”. The showdown between Governor Scott Walker and the state’s public sector union members came to a head in February when despite the unions’ concessions to significant benefit give back demands, Walker insisted on taking away all of the unions’ bargaining power except their right to bargain on wages. Under the new law, unions would not only lose collective bargaining power, but would have to be reapproved annually by workers, and would have to collect dues themselves; union dues would no longer be deducted from workers’ paychecks. This has the potential to significantly cut union revenues by up to one-third. Unions saw this as a blatant attempt to bust union power. In spite of large protests and Democratic legislators’ efforts to prevent passage of the bill, ultimately Governor Walker signed the anti-union bill into law. Notwithstanding the negative national publicity that Walker and the Wisconsin legislature received, many states have followed Wisconsin’s lead with similar legislation curtailing the power of public sector unions. States such as Ohio, Michigan, Indiana, and Arizona have passed or are considering similarly drastic measures. Other states such as Florida, Alabama, Tennessee, Nebraska, Kansas, and Oklahoma are contemplating somewhat less severe measures such as restricting the collection of union dues, limiting collective bargaining, or preventing unions from monopolizing the workforce. Republicans argue that cutting back the power of unions is crucial to getting government costs under control and creating an environment that will attract businesses and create jobs. However, these measures do not come without huge cuts to benefits, and at the cost of jobs protected by unions. These costs do not affect citizens equally across the board. Latinos disproportionately rely on the protections of unions for jobs with higher wages and better benefits. Additionally, in the states where anti-union legislation is most prominently being considered, Latinos are a growing number of the population and they make up a significant part of the overall union and public sector union workforce. The major benefit of union membership is the ability to negotiate a contract with employers for fair wages and salary. Unionized Latinos earn approximately 51 percent more than their non-union counterparts (LCLAA 2011). For public sector employees, the wage and benefit advantages are often even greater because in many states, public sector unions hold a monopoly on these jobs. Public sector unions are particularly important for communities of color. Non-union, non-white public sector workers are vulnerable to falling farther below the median income compared to their white coworkers (Agbede 2011). This vulnerability stems from the fact that Latinos, along with other minority groups, fill jobs at the lower end of the wage scale. These jobs are the least likely to be protected by unions or are the first to be victimized by anti-union legislation. Therefore, Latinos as some of the last people to break into middle class status (with the help of union protected jobs), may be some of the first to depart. 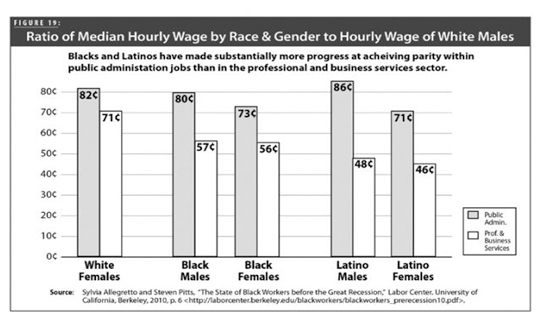 The figure below shows how the public sector has offered more opportunity for Latinos to achieve greater wage parity with white men compared to jobs in the private sector. While union membership is greater among non-Latinos than Latinos, a comparison of the numbers reveals that the difference between the two groups is not very significant. 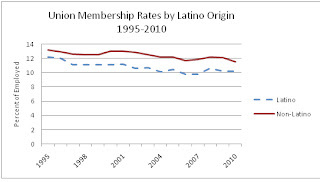 The figure below shows that union membership for non-Latinos in 2010 was 11.5%, compared to 10.2% for Latinos. Union membership is down for both groups since its height of 1995 (the highest for the fifteen year period under observation). The downturn, however, has not been linear. 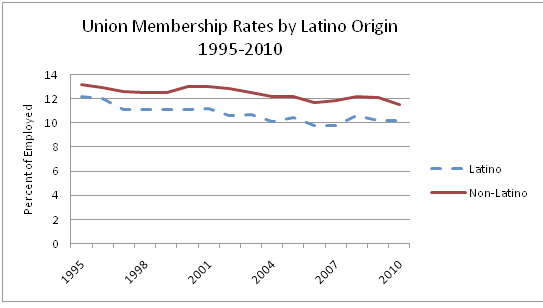 In fact Latinos have seen a more recent spike in union membership (2008) than non-Latinos (2000). Future trends are difficult to predict, but will likely be significantly influenced in the foreseeable future by the ant-union measures being carried out. The graph below displays the growth in the Latino population as a percentage of growth in total population for 2000 to 2010 for each state that has passed or is considering passing anti-union legislation. Traditionally, many of these states have not had large Latino populations, but as the graph shows, Latinos account for a large proportion of the population increases. Nebraska is a good example of a non-traditional Latino state, but one with an upward trend in Latino population. Latinos accounted for 70 percent of the growth in population in Nebraska from 2000 to 2010. In 2000, Latinos encompassed 5.5 percent of Nebraska’s population and today it is close to 8 percent. 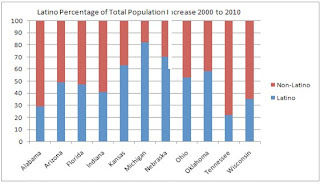 Similar increases can be seen in Michigan and Kansas. Other states that have passed or are considering anti-union legislation are more traditional Latino gateway destinations such as Arizona and Florida. 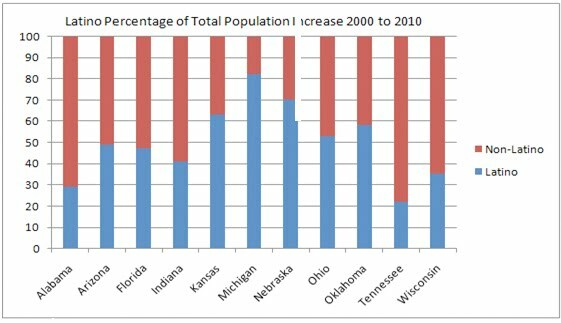 Both of these states continue to see large increases in Latino population as a percentage of total population growth. It is also important to note that among all these states, there is a mixture of both traditional conservative states (e.g. Alabama and Oklahoma) and much more moderate states (e.g., Ohio, Florida, Michigan, Arizona, and Wisconsin). Republican Governor Scott Walker in Wisconsin was elected with only a 52% majority in 2010. Multi-generation Latinos have a lot at stake in the current battle to curtail the power of public sector unions. 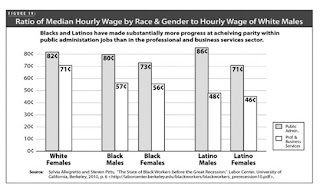 Latinos disproportionately represent low-wage jobs and have relied heavily on the efforts of unions to negotiate fair wages and benefits. If the power of unions is severely curtailed, many Latinos may be left without this protection. This vulnerability for Latinos is confounded by the fact that they are one of the least likely groups to obtain a higher education (U.S. Dept. of Education 2010). Unions play an even greater role in diminishing wage inequalities for workers without college degrees (Agbede 2011). In the wake of the passage of anti-union legislation in Wisconsin and the protests that accompanied it, nineteen prominent national Latino organizations came out in opposition to attacks on public sector unions and their collective bargaining rights. These groups included League of United Latin American Citizens (LULAC), National Hispanic Caucus of State Legislators (NHCSL), National Institute for Latino Policy (NILP), Cuban American National Council (CNC), and Mexican American Political Association (MAPA). What role will these organizations play moving forward? Will these organizations help galvanize support among Latinos, not only in the states where unions are currently being threatened, but nationwide? What role will this issue play in the 2012 elections? Will Latinos be mobilized to vote on the issue of union protection? There is an opportunity for Latinos to significantly affect how this debate plays out. It is up to political and organizational leaders to see that the voices of those greatly affected by diminishing union power are not drowned out. Stella Manrique Rouse is an Assistant Professor of Government and Politics at the University of Maryland and a Ford Foundation Post Doctoral Fellow. She has a forthcoming article, “Networks in the Legislative Arena: How Group Dynamics Affect Cosponsorship” in Legislative Studies Quarterly.